Miguel Almiron has said Major League Soccer is "improving" as he was unveiled as Newcastle United's record signing on Thursday following his transfer to the Premier League. 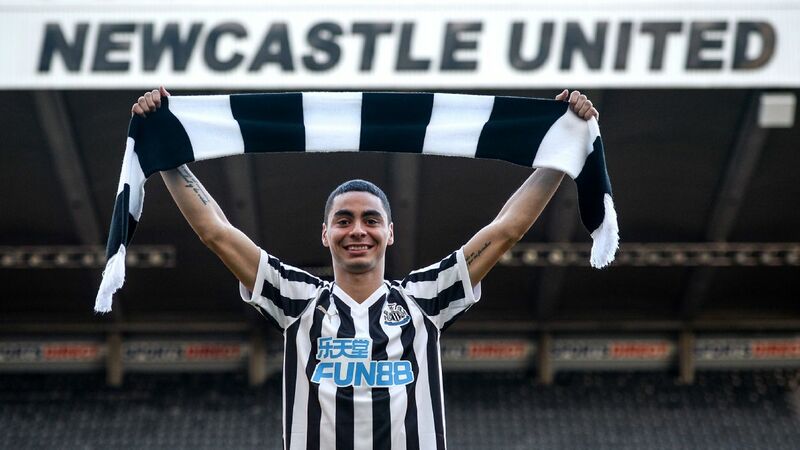 Former Atlanta United forward Almiron joined Newcastle for £20 million ($26m) on deadline day last month, the highest amount received by an MLS club in the league's history. With reports linking him with a move to the Premier League, Atlanta United's Miguel Almiron explains what he admires most about the English top flight. Atlanta United midfielder Miguel Almiron has told ESPN FC it is the Premier League's "competitiveness" which attracts him ahead of La Liga. While many South American players gravitate toward Spain, but the Paraguay international, 24, has never hidden his desire to play in the English top flight and is a reported target for Newcastle. The United States men's soccer team are without a permanent manager, but MLS commissioner Don Garber may have inadvertently confirmed Mexico's new boss. Speaking to reporters at the Soccerex conference in Miami on Thursday, Garber congratulated Mexico for their "aggressive move" for Atlanta United coach Gerardo "Tata" Martino. Atlanta United manager Gerardo "Tata" Martino avoided addressing rumors that he is in the running for head coaching jobs with Argentina and Mexico, telling reporters on Friday that he is solely focused on his own MLS club right now. Earlier this week sources told various ESPN reporters that Martino is a serious candidate to take over at El Tri after Ricardo Ferretti was officially ruled out of contention for the position on Tuesday. Atlanta United manager Gerardo "Tata" Martino has emerged as a serious candidate to take over as the Mexico head coach, sources have told ESPN, with Ricardo Ferretti officially ruled out of contention for the position on Tuesday. ESPN Deportes' Hernan Pereyra and Jose Ramon Fernandez both stated Tuesday on air that Martino will be the next Mexico head coach, while BeIN Sports stated that only a verbal agreement had been reached.